Yes you can cook fast and healthy meals for your family with natural whole ingredients! "By the way - I did get your... book, Fast and Healthy Menus For Busy Moms, (that would be me!) and I LOVE it !!! I printed out the book and sat down last night and read through it. What a ton of wonderful information. My husband and I really enjoyed it and I'm sure I will be cooking many of the recipes and allowing my girls who are 9 and 11 to also, and also my 6 yr. old son, who loves to bake :) Thanks again!" Another reader said: "I am one of the many subscribers to TOS that also was blessed with your ecookbook. Thank you for that...my family has loved each of the recipes that I have made per your suggestions. Thank you, thank you." Would you like to have your family rise up and say you are blessed of all mothers for making tasty, delicious dinners? 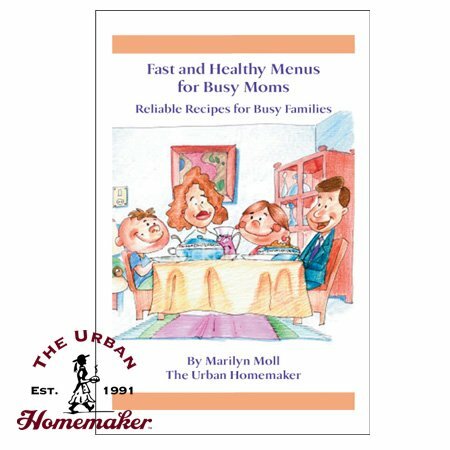 These Fast and Healthy Menus and Recipes from Marilyn Moll, the Urban Homemaker, have been tested and used on a regular basis by my family over the years and are sure to become your family favorites too!